AMA! Today at 4pm EST! Come along and check out our AMA at 4pm EST today (26th January 2016). Ask Steve or Myself (Shawn) anything about our games, our kids, sleepless nights, lutes, Quest for Infamy, or even future projects! It’ll be fun! AMA! 26th January! – 2 Days to go! We’ll be holding an AMA on Reddit on launch day, January 26th starting at 4pm EST (1pm West Coast time). Always had a question you wanted to ask us? This is your opportunity! We’ll provide a link a bit before it starts! Order of the Thorne – 5 days to go! “Of course, Grand Master. I am always at your service,” he replied while he looked around the Grand Master’s chambers. The furnishings were sparse, as he had expected from someone of her position, while the bulk of the room was taken up by the large oak desk which the Grand Master was currently sitting behind. Everything on the desk was in order, neatly stacked piles of papers sat to the side of the one she was currently working on while her quill and ink-well sat neatly above them. The only other item on her desk was the seal of the Order, used on any official communications such as the letter which brought him here today. “Brother Kunchen, I’ve asked you here today to take on a very special mission for the Order. Our monestary in the Faerie Realm has been left unmanned for a number of months since our brother there passed away. I’d like you to take up the monastary there, conduct any repairs it may require and fly the flag of the Order, so to speak,” the Grand Master said. “Good! Good. Speak to my chamberlain about anything you require for your journey when you leave,” she said by way of dismissing him. “I will Grand Master. And thank you again.” Brother Kunchen walked out of the room and closed the door quietly behind him, his head already full of the plans he had to make for his mission. The Grand Master watched him leave and for a moment envied him. To run a monastary was a high honor. Of course, to be Grand Master was also a high honor, but with much more responsibility. Sighing, she returned to the paper she was studying before Brother Kunchen had interrupted her. Order of the Thorne Q&A – 7 Days to go! Before we start, here’s the brand new trailer for newest game, Order of the Thorne: The King’s Challenge, which is out January 26th. This time next week you’ll be able to get the first Order of the Thorne game, and we’re very excited to see what everyone thinks! To kick off our launch week celebrations we give you an interview with Shawn Mills, Executive Producer of The King’s Challenge and ask him the tough questions! We’re pleased to tell you that The Order of the Thorne – The King’s Challenge will be released on Tuesday, January 26th, 2016! It will be available on GoG, Steam, Humble and Itch.io! 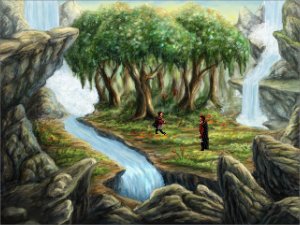 We’re very excited to bring you the first game in The Order of the Thorne Anthology Series. 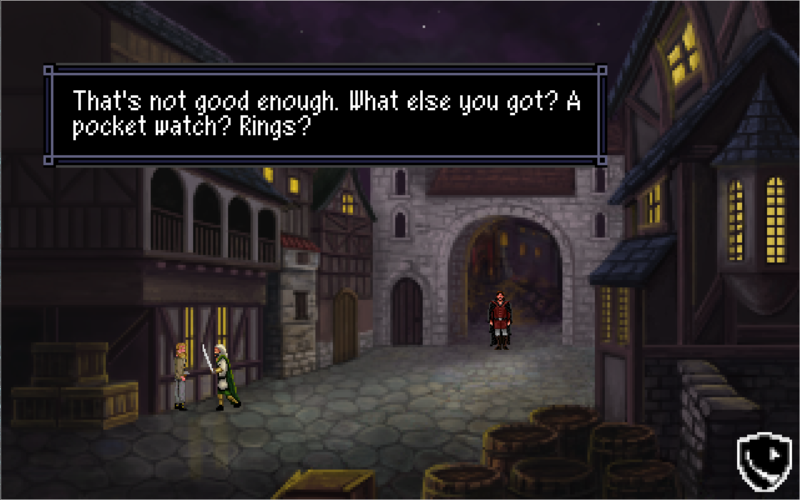 It’s been over a year since our first commercial game, Quest for Infamy, was released and with the impending release of our next two games I figured it was as good a time as any to look back at what we’d done and make some of my thoughts public. I’m going to try and be objective in this article, but as with anything creative, a lot of ourselves went into it so a lot of the time things I like or hate are my personal feelings. There’s plenty of reviews on the internet if you want to see what other people thought! Steve (Steven Alexander – my partner is this crazy game creation business) and I have talked a lot about our game in the time since it’s release and we’re pretty much on the same page with this stuff, so while I’m making writing this post, we’re both in agreement about it. Two final thoughts before we start, a lot of people worked very hard on this game so I’m using the the terms “we” and “our” when talking about it to simplify matters. And secondly, this is going to be quite a long post, so grab a drink! 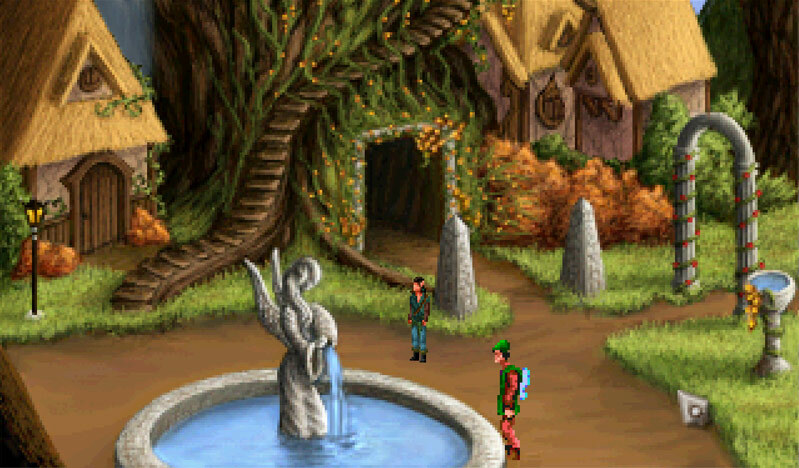 We have been talking a lot about Order of the Thorne : The King’s Challenge lately, and rightly so because it’s a bloody fun game, but I just wanted to let you all know we hadn’t forgotten our Mr William Roehm! Roehm’s adventures continue (or should that be begin?) in Roehm to Ruin, the second of our games to be released very soon. One of the early events that happens is this shakedown of his friend Gareth, a local fish-monger and supplier of illegal pharmaceutical enhancements. Does Roehm help out his friend? Does he run and get some guards? Does he help the thief? You’ll work it out, we’re sure! Roehm to Ruin is now complete and all the graphical assets are in the game and working a treat! The game is being tested as we speak (or type in my case) and after some more runs through the testing machine we’ll get the speech recorded and in-game, for your listening pleasure! 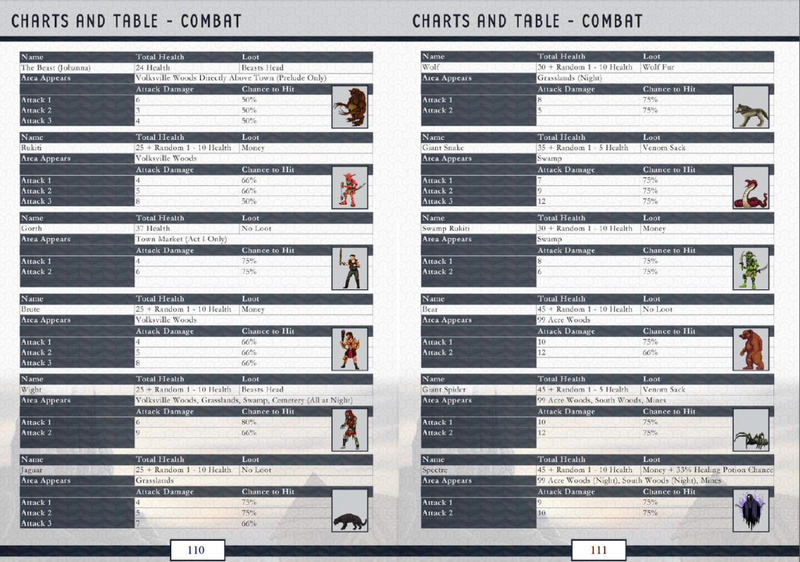 We sent out this update to our backers last week but we wanted to share the news with everyone as we’re delighted to announce that the QFI Companion will go to press in it’s final form! 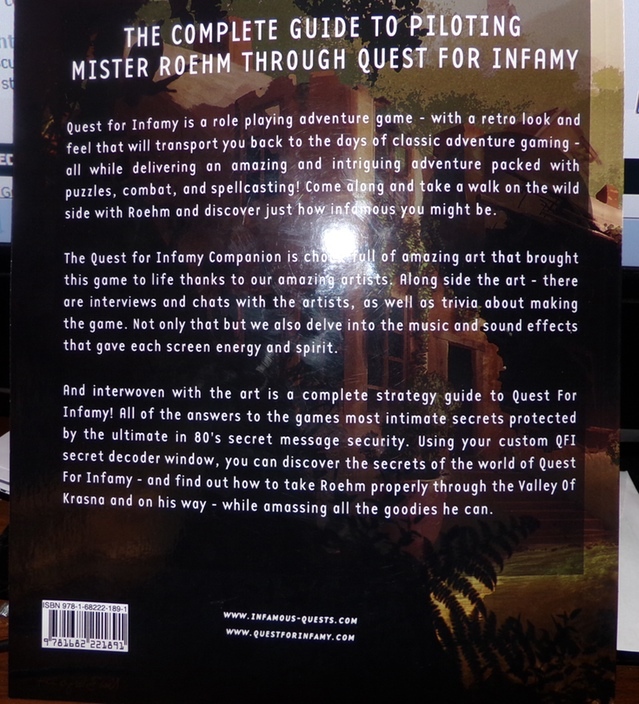 We’ve had a busy last few months, with the production of our three new games (QFI: Roehm to Ruin, The Order of the Thorne – The King’s Challenge and OotT: The Fortress of Fire) but Broomie managed to put in the time, care and attention to finishing up the companion to Quest for Infamy. 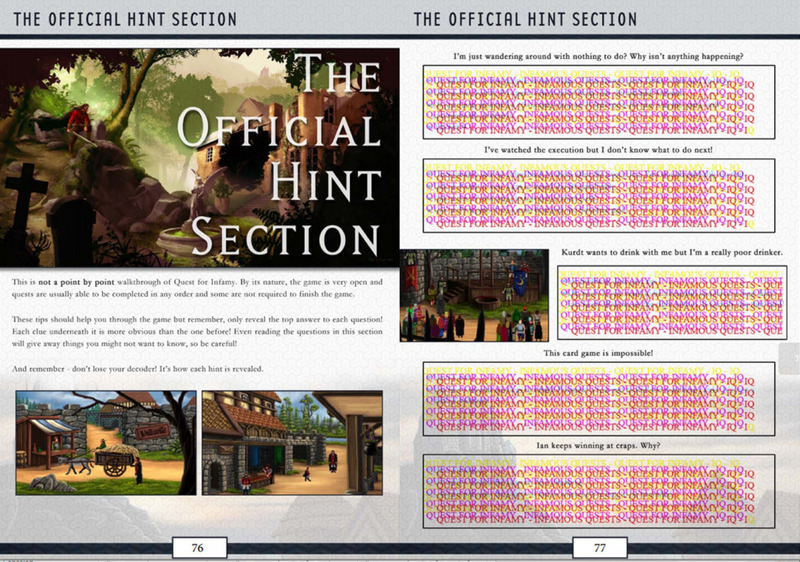 We’ve jam packed it full of information, behind the scenes tid-bits, beautifully reproduced artwork in full color and an amazing hint section. 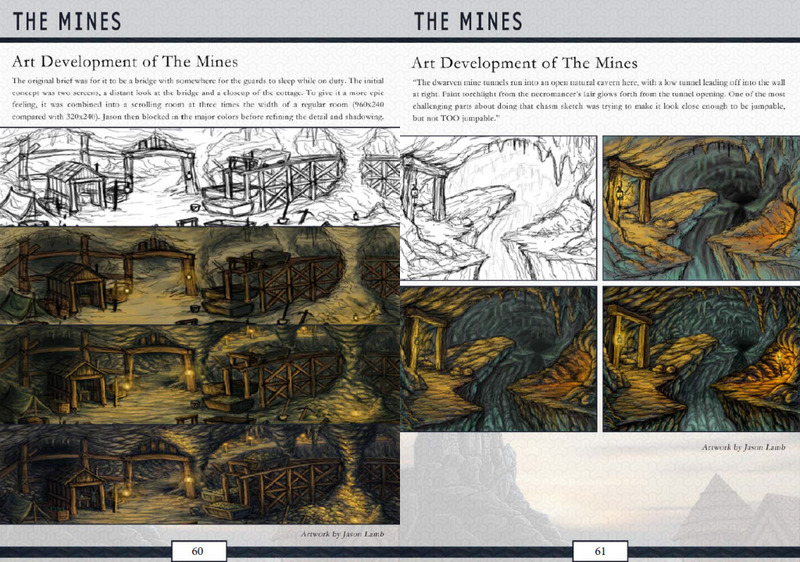 Making a book is difficult, especially when you have a small team working on it! We had a few technical difficulties in formatting the book for the printer we’re using – and that took a lot of testing, trial and error and extra late nights working on it. 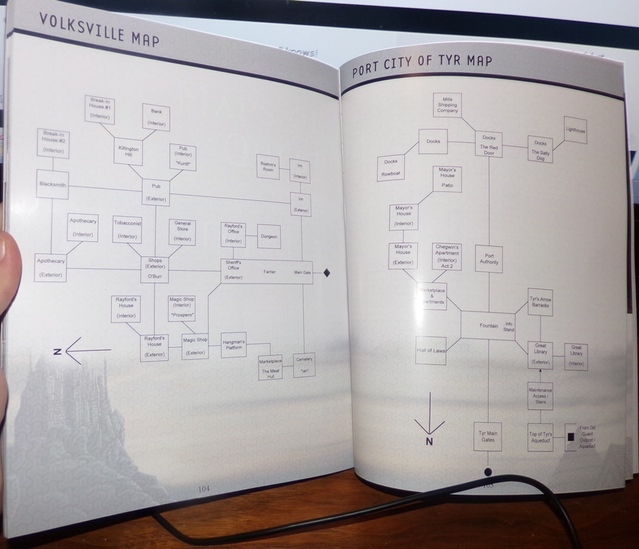 Last week, we finally got our test proof for the book! The book, in all its glory. Another shot of the cover. 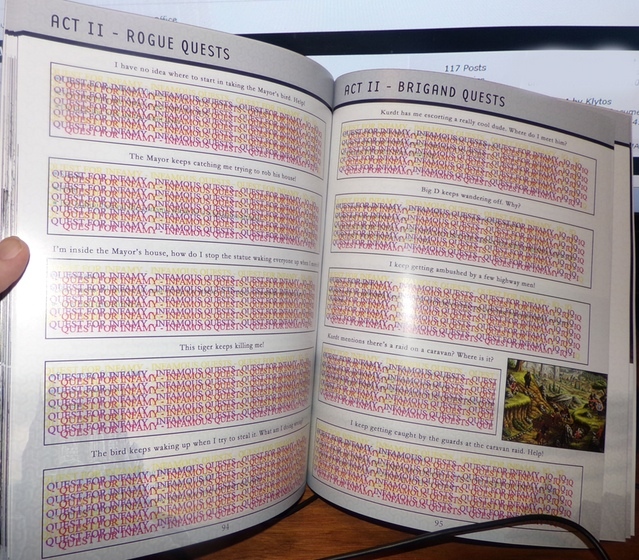 Here are some shots on the inside covers. 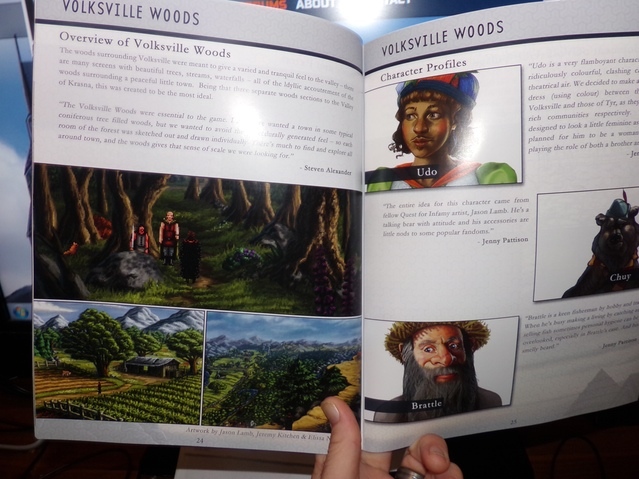 Full maps of The Valley of Krasna! The unfortunately misprinted red-reveal page. Other than these minor changes, the book is ready and now going to the presses! The book looks amazing in hand – I’ve been showing it to friends and family, beaming, because our artists works look so amazing in print. 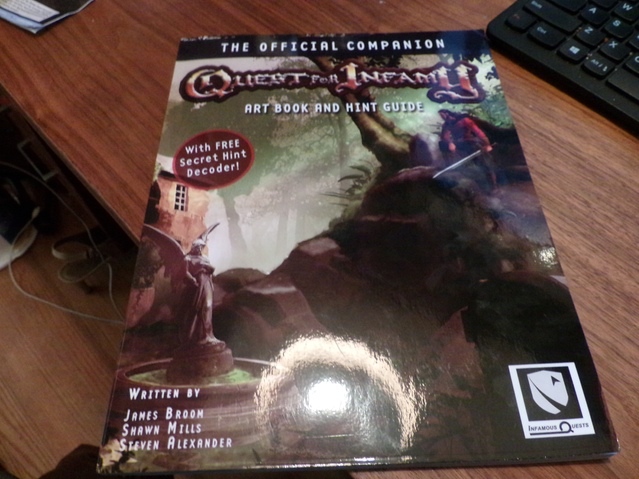 The book is nice and large, and is a real testament not only to the team who made QFI come to life, but to all of you too. I should be receiving several large shipments of books in about three weeks, they tell me, and as soon as they come in to me, they go out to you. I hope this book finds a place in your collection – and even on a coffee table. 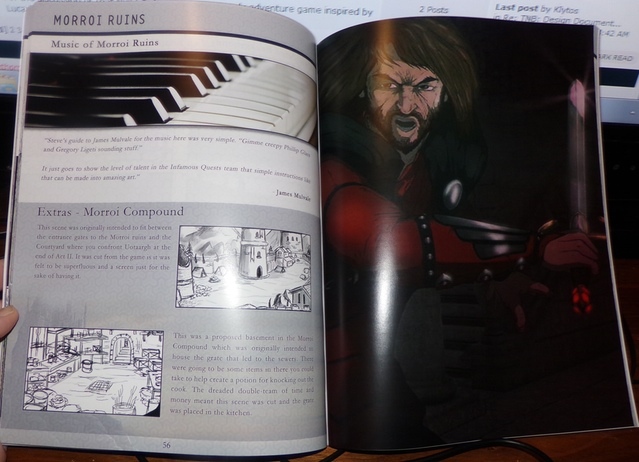 I hope someday guests and friends flip through the book, look at the pictures and ask “What is this?” and you can say, “Oh, it’s a video game I helped make a few years ago.” and smile, like a boss. Hello! First off, just wanted to mention that Quest for Infamy was released one year ago and it’s been one hell of a year since! We’re blown away by all the kind words and feedback we’ve had since its release. It’s been an incredible adventure and we want to thank everyone who has supported us by buying a copy. We’ll have some more QFI related news very soon but for now, Happy Birthday Mister Roehm. To celebrate we’ve partnered with Humble Store to offer Quest for Infamy with the Official Soundtrack for $9.99. This awesome deal ends 31st July so please buy, share and do what you can to exploit this deal. Well, not exploit against us but the closest that exploit and support can be. And today also marks another milestone. The Quest for Infamy Companion is complete! Prior to further proofing and amendments, we’ll be sending it to the printers very soon. As of right now I can’t specify a date of when our backers will be receiving a copy but rest assured you’ll be smelling the fresh prints of our guide books very soon. For now though, here’s a couple of preview shots of how it’s looking. We’re really happy with how the book is looking and as soon as we have a date of when we can start sending copies out to our backers we will let you know. 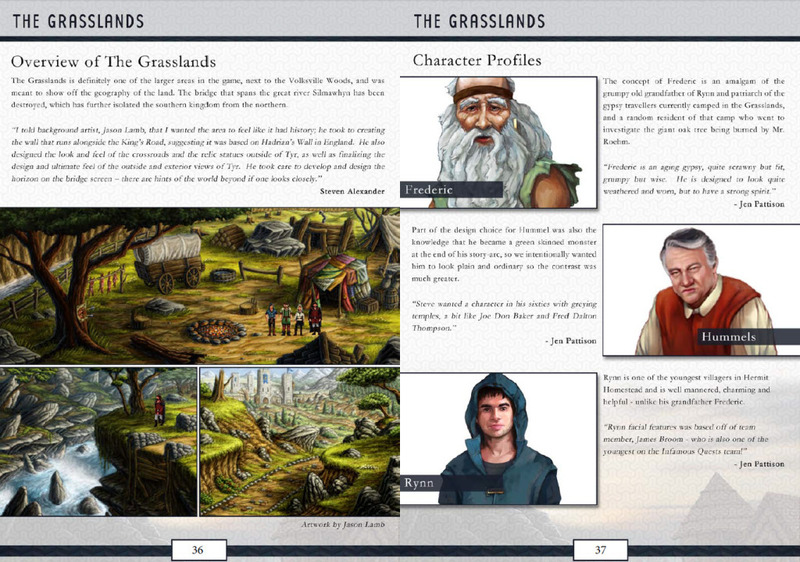 As for non-backers, the Companion will be available to buy from our website as a physical and digital version. 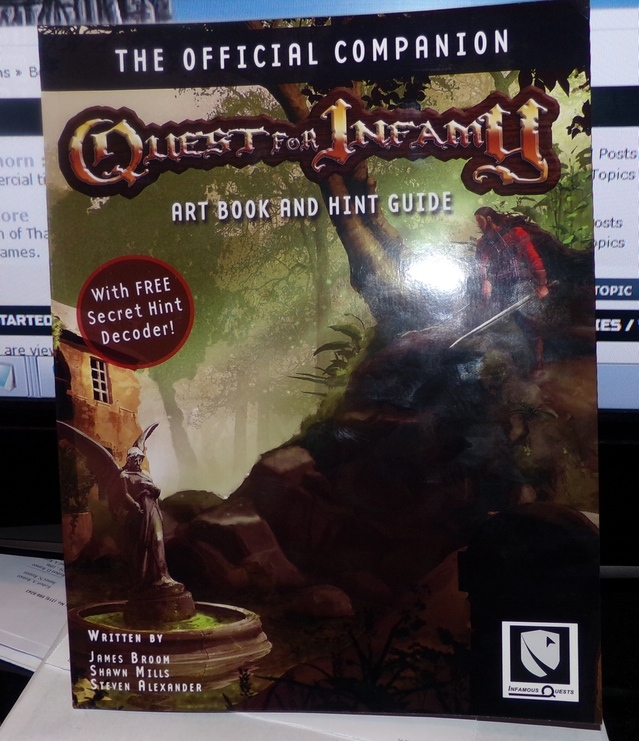 Also, regarding the physical items (or swag) for the original Quest for Infamy Kickstarter, all we can say right now is we’re working on it. We’ve got the numbers and figures all laid out and we’re currently dealing with the manufacturers and distributors to get everything sorted. Rest assured, your swag is coming and we’re doing all we can to get these sweet items to you. Don’t forget to check out our latest projects, Order of the Thorne and Roehm to Ruin. Coming soon! Infamous Quests will be attending the Wales Game Development Show in Cardiff, Wales on June 19th. 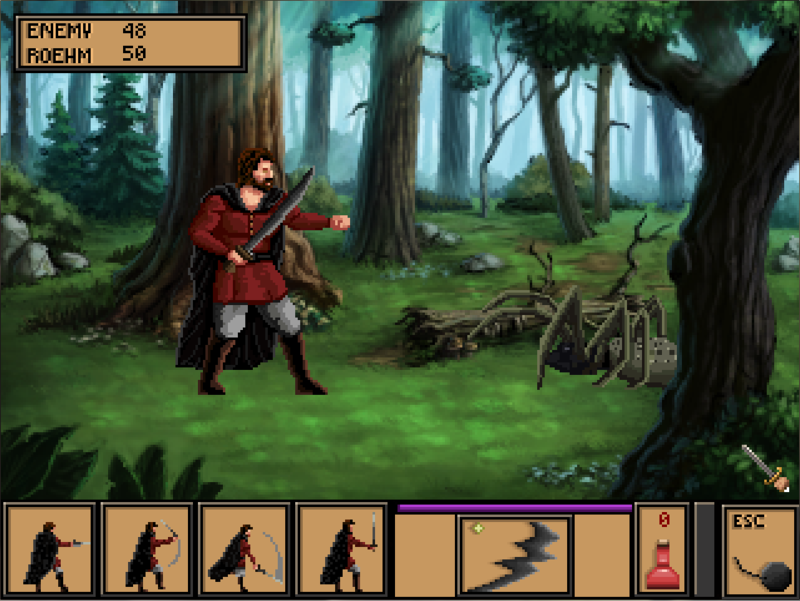 We will have a table set up with a playable demo of Order of the Thorne: The King’s Challenge and happy to answer any questions you might have. So if you’re from around the area and can make it than we would love to have your input on the demo. We’ll be there all day so be sure to pop by and say hello! For more information and directions to the venue please out the official website. Don’t forget to check out the other games that will feature in the video below. Hope to see you there!